Here we have part of the Nick Cockerham crew of October 19. 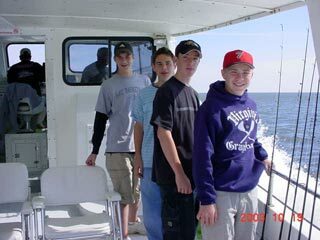 From left to right, that's David, Jordan, Adam, and Pete. 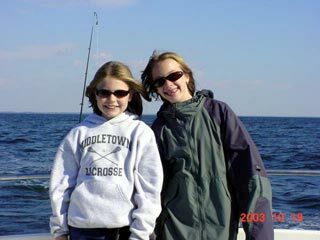 And more members of the Cockerham crew -- Julia and Leah. 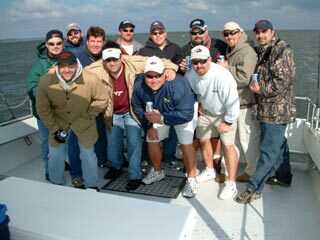 And here we have one of five crews on a multi-boat charter for the 8th Annual Harrison Brothers Fishing Tournament, led by Greg Harrison (3rd from left). 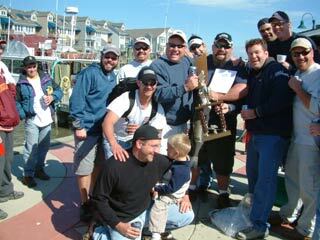 And here's Greg and his crew holding the first place trophy. 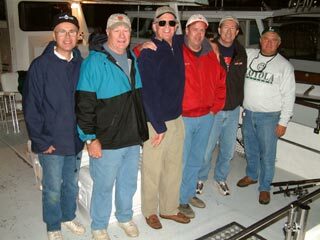 And here we have the Mike Stedman (2nd from left) crew from October 17 after an afternoon of chumming for rockfish. 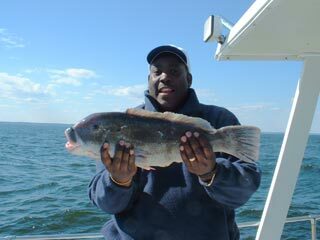 Here we have one happy angler and a 5 pound tautog (blackfish), the first one Captain Drew has seen in many years of fishing the mid-Bay area. The nice tog took a razor clam in the chum slick. 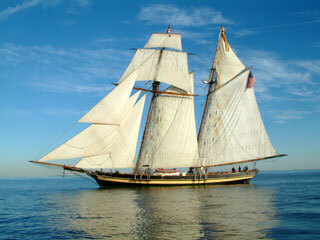 Here we have the "Pride of Baltimore II" under full sail, heading back up the Bay on the afternoon of October 13. 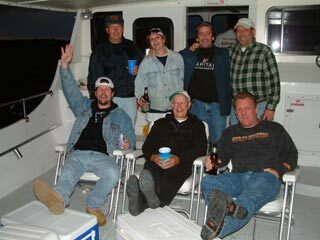 And here's the Peter Charney crew after a great day of rockfishing. From left to right, that's Steve, Elmer, Lou, Don, "Chief", Dave, Tom, Pete, Ron, and Chad (kneeling). On October 12 the Worm traveled down to Solomon's Island to participate in the "Annual Watermans Day Festival", hosted by the Calvert County Watermans Association. For more photos, click here. 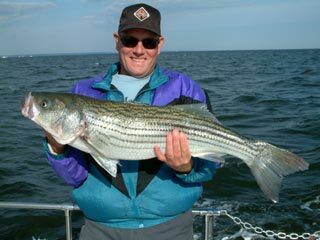 Here's Steve Delee with a beautiful 34 inch striper he caught while fishing October 5 aboard the Worm as part of a multi-boat trip. 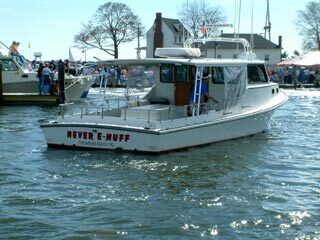 And here we have the Cindy Evans (2nd from left standing) crew of October 4 with friends and family, out for a relaxing day on the Bay. 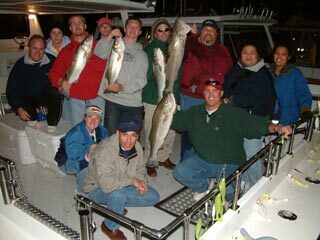 And here's a crew from HITT Contracting, led by Steve Richbourg (right foreground), shown with some of their fine catch from October 3. 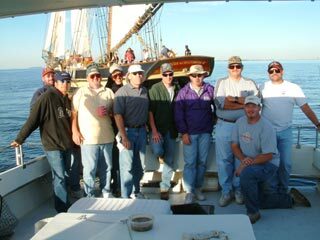 For more photos of the HITT crew, click here.